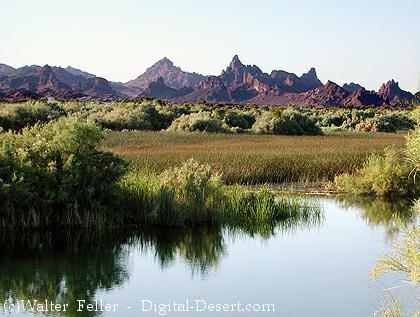 The 37,515-acre Havasu National Wildlife Refuge is one of more than 500 refuges throughout the United States managed by the Fish and Wildlife Service. The National Wildlife Refuge System is the only national system of lands dedicated to conserving our wildlife heritage for people today and for generations yet to come. From desert bighorn sheep to the endangered southwestern willow flycatcher, birds and other animals at Havasu National Wildlife Refuge rely on the life-giving waters of the lower Colorado River. 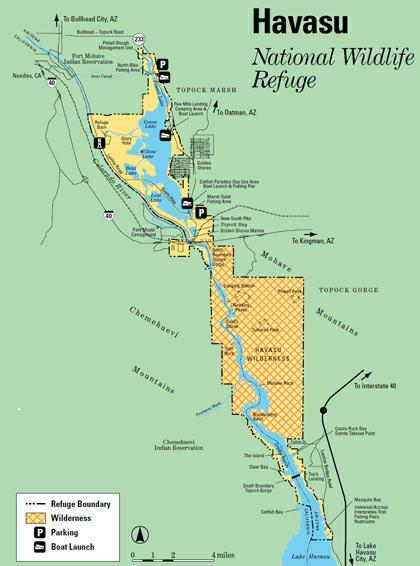 The refuge protects 30 river miles—300 miles of shoreline—from Needles, California, to Lake Havasu City, Arizona. One of the last remaining natural stretches of the lower Colorado River flows through the 20-mile-long Topock Gorge. A great river in a dry, hot land attracts wildlife and people like a powerful magnet. Today, many thousands of visitors annually flock to the refuge to boat through the spectacular Topock Gorge, watch waterbirds in Topock Marsh, or hike to the Needles and Havasu Wilderness Area. Wildlife dwell in a precarious balance with the people who recreate here. Remember, we are guests in the home of lower Colorado River animals and plants. Indian petroglyphs in Topock Gorge trace the stories of early peoples who lived along the lower Colorado River. A few old mines tell a more recent tale of nineteenth century gold prospectors hoping to strike it rich. When the gates closed at Parker Dam in 1941, President Franklin D. Roosevelt created Havasu NWR to provide migratory waterfowl habitat. The refuge has shifted boundaries since then, including the addition of the Needles Peaks area in 1968. Topock Marsh, Topock Gorge, and Needles and Havasu Wilderness form three distinct areas, each with its own attractions and regulations designed to protect the rare beauty of Havasu NWR. These two wilderness areas offer their quiet desert beauty for the prepared hiker. The first rule is to bring plenty of water. Every plant and animal has adapted to desert living. Cactus store water during rainy periods. Palo verde trees drop their water-wasting leaves when rain is scarce. Lizards and snakes find all the water they need from the food they eat. The passage of the Arizona Desert Wilderness Act in 1990 and the California Desert Protection Act in 1994, together designated 17,606 acres, or 32 percent of the refuge, as wilderness.